In this blog post we showcase what is new in Matomo (Piwik) 2.16.0 and why you should upgrade your Matomo to this latest release! Matomo (Piwik) 2.16.0 is currently in Release Candidate and you can already use it by following these simple instructions. Matomo 2.16.0 will be officially released in a few days. To see the list of all 250+ changes, read the Matomo (Piwik) 2.16.0 changelog. Matomo (Piwik) 2.16.0 is our Long Term Support version for Matomo 2. Learn more about Matomo LTS. 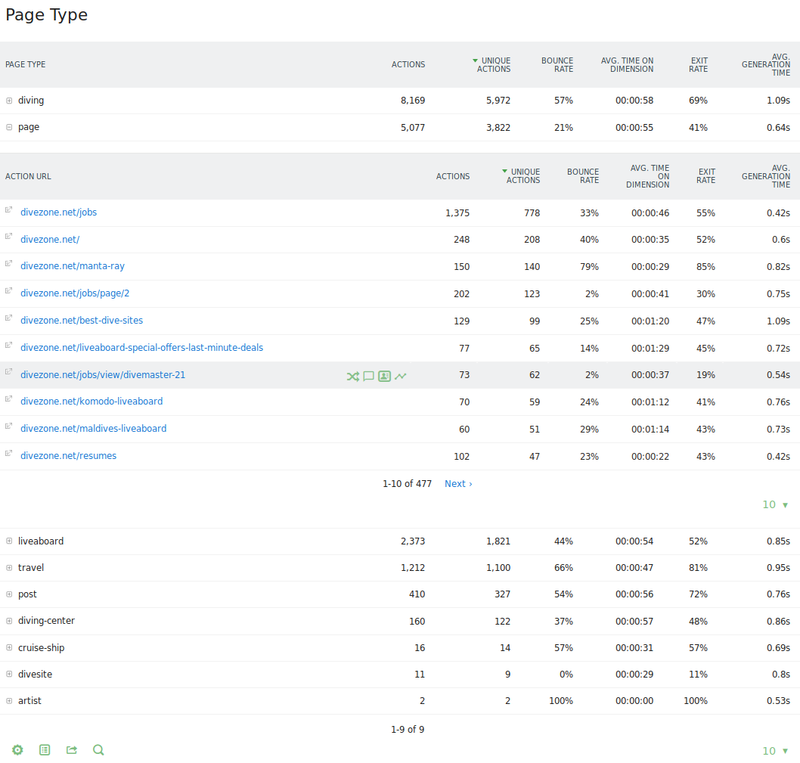 With Custom Dimensions you can assign any custom data to your visitors or actions (like pages, events, …) and then visualize the reports of how many visits, conversions, pageviews, etc. there were for each Custom Dimension. They are similar to Custom Variables see the comparison of Custom Dimensions and Custom Variables. The new Custom Dimensions plugin is available on the Matomo (Piwik) Marketplace. Learn more about creating, tracking, reporting, managing, segmenting custom dimensions in the Custom Dimensions user guide. By default in Actions > Events report, the columns displayed are “Total events” (Total number of events) and “Total value” (the sum of event values). It is now possible to click on the footer icon to view more detailed columns about event values: minimum event value, maximum event value, and average event value. New themes on the Marketplace! Feel like a change of colors? Try out the new community submitted Matomo (Piwik) Themes on the Marketplace! Learn how to install a new theme in Matomo (in only a few clicks). You can now segment by device brands such as Apple, Samsung, LG, Google, Nokia, Sony, Lenovo, Alcatel, etc. The complete list of device brands you can use is listed on the Segmentation developer guide. 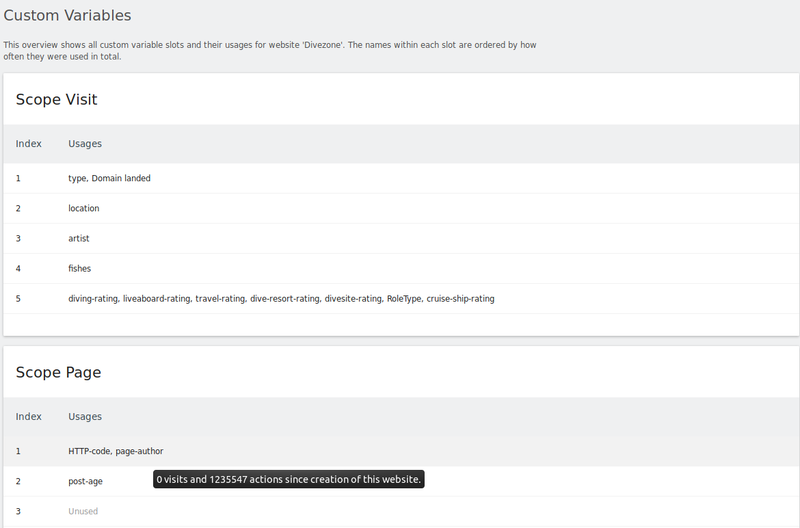 Use the new “Action type” segment to view only particular actions such as: pageviews, contents, sitesearches, events, outlinks and downloads. 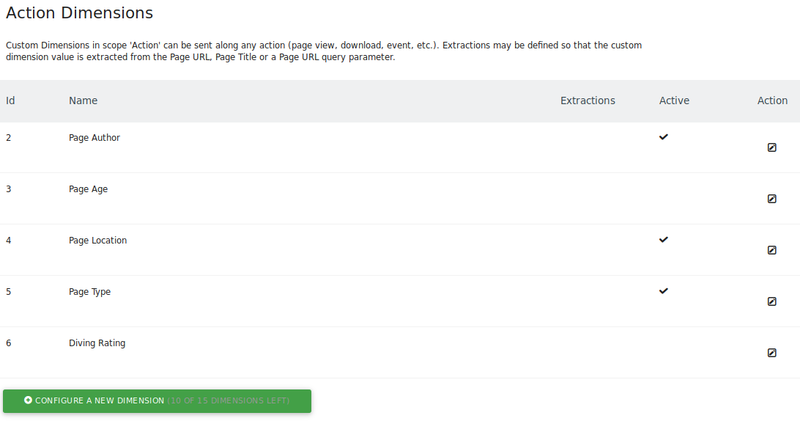 Use the new “Action URL” segment to view any action that matches a given URL, whether they are Pageviews, Site searches, Contents, Downloads or Events. The new segment operators “Starts with” and “Ends with” can come handy when creating Custom Segments, and complement well the existing segment operators: Contains, Does not contain, Equals, Not equals, Greater than or equal to, Less than or equal to. Learn more about Segmentation in our user guides or in the Segmentation developer guide. Web accessibility refers to the inclusive practice of removing barriers that prevent interaction with, or access to applications or websites, by people with disabilities. When sites are correctly designed, developed and edited, all users have equal access to information and functionality. 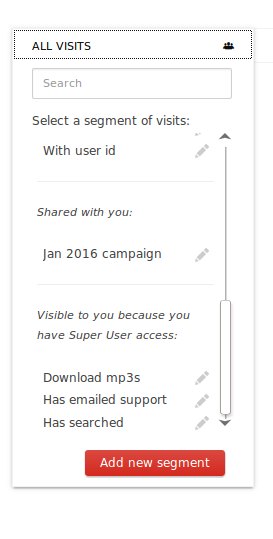 ‘Skip to main content’ link (when pressing the TAB key) now skips the cursor to the page content. Matomo (Piwik) 2.16.0 just became even more respectful of your privacy: any user you created and assigned an “admin” permission will not be able to view all other usernames anymore. This change was requested by many Matomo users who rightfully preferred not to disclose all usernames to any ‘admin’ user. 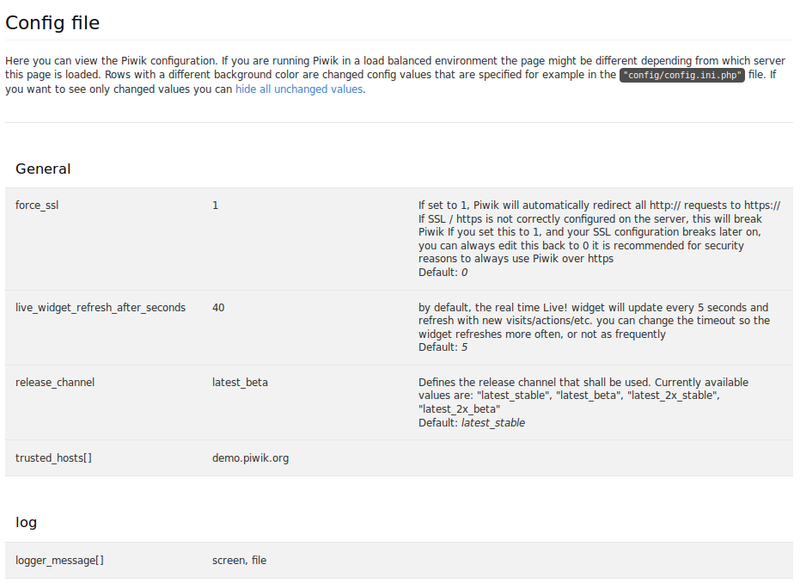 help Matomo (Piwik) administrators discover and learn about all the possible config file settings that Matomo offers. let Super Users and Admins easily view any overridden config.ini.php INI setting without having to open the config file on the server. A new report visible to Super Users lets you see how your Custom Variables slots are being used, which ones are still unused, and how many times a given custom variable name was used. Learn more about Custom Variables. The heartbeat feature which lets you accurately track how long do visitors spend on your website, has been improved in 2.16.0. If you would like to measure how long do people spend on your pages (even if they don’t interact with your website or app), then consider using the heartbeat feature. Learn more in our guide Accurately measure the time spent on each page. 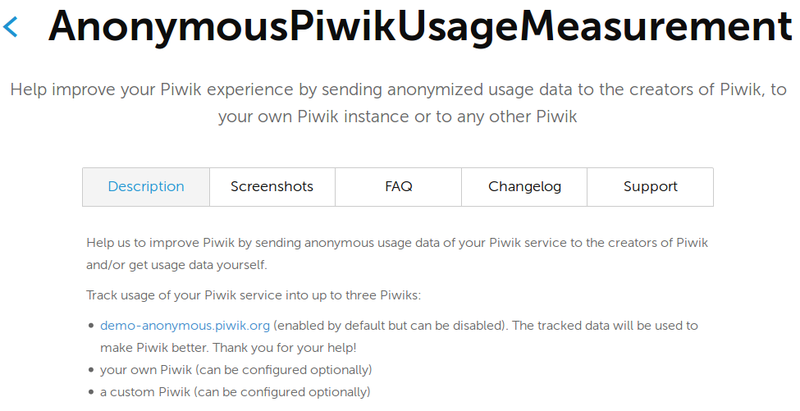 AnonymousPiwikUsageMeasurement plugin was created for those who would like to measure how their Matomo (Piwik) services is being used. This plugin also sends anonymised tracking data to our demo-anonymous.piwik.org which will help us learn how your Matomo is used and how we could improve the application. Learn more about AnonymousPiwikUsageMeasurement plugin. The awesome Matomo (Piwik) community has helped us identify several issues with MySQL 5.7 support and Matomo is now fully compatible with the latest MySQL version 5.7+. Matomo is officially compatible with MySQL >= 4.1 and up to Mysql 5.7! Matomo is also compatible with MariaDB. Our Device Detector library can now detect many new types of devices: smart TVs, new tablets and mobile phones, and more. 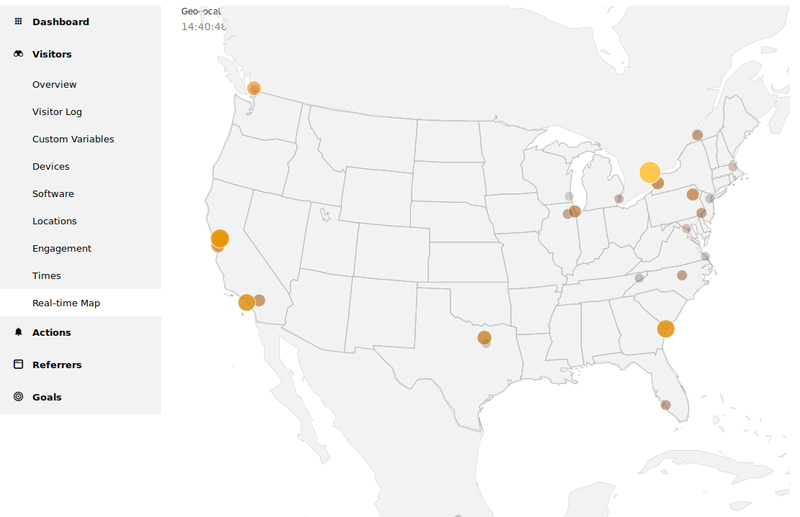 New bots were added to our list of bots to keep your analytics report meaningful. Learn more: What Device Detector is able to detect, About Device Detector. Every week we keep updating our community-list of referrer spammers. More than 50 new spammers were added since the last Matomo (Piwik) release! Note that the list of referrer spammer is automatically updated every week in your Matomo (Piwik), so you need to wait at most one week to benefit from the very latest list. Learn more about Stopping Referrer Spam in Analytics reports. When you create scheduled reports in Matomo (Piwik), you can specify one or several email addresses (to send reports by email) and you can also configure phone numbers (so your reports are sent to your phone via text message). So far we only support one SMS Provider “Clockwork SMS” but it is now possible for anyone to create a very simple plugin that adds a new SMS Provider to Matomo. A new SMS Provider plugin was released on the Marketplace: FreeMobileMessaging. If you have a favorite SMS Provider, we encourage you to create a new plugin for it! A few new mentions of Matomo (Piwik) Consultants were added into Matomo to let users know that they can get Professional Help, and additional services and products. For example a new widget was added to the default dashboard. If you provide your Matomo service to your own clients, maybe you would like to remove the Professional services widget and other ads, see this FAQ: How do I remove from Matomo the links to “Matomo Consultants” or to “Professional Services”? Dozens of other bugs were fixed (including several Major bugs) and many small improvements are included in this release. All these changes make Matomo (Piwik) more stable and reliable, as well as easier to troubleshoot and maintain. We are proud to be able to offer Matomo 2.16.0 as our Long Term Support release! If you have any feedback, questions, suggestion, or bug to report, please join our Matomo (Piwik) Community Forums. We hope you will love this 2.16.0 release as much as we loved making it.